why is it always Jesus? why not Allah? or Steve from Wal-Mart? Looks more like the Colonel to me. Yo thats not the savior of man its Colonel Sanders. I dont feel closer any to god, I just want some fried chicken! Yes! I’ll pay 50 dollars for one! That doesn’t look anything like her. Jesus is not even real. @przxqgl: I don’t really think most religious people suffer from Pareidolia. @numb7rs: Looks nothing like me. @storminator: @ColombianMonkey: Jesus, was/is Persian like the rest of the Jews in the middle-east. What’s worse than finding Jesus in your Kit-Kat bar? Finding half a Jesus! @ColombianMonkey: The average Persian; Jew or otherwise, is/was as “black” as the average Colombian. But you are all wrong. It’s obviously Pan on a Kit Kat. @sylvanish: as black as the motherfucking socrates? nope. @ColombianMonkey: …what? Socrates? …as in the Greek philosopher? This looks more like Falkor from the Neverending Story. That’s not Jesus. He’s dead. That’s Frank Zappa. 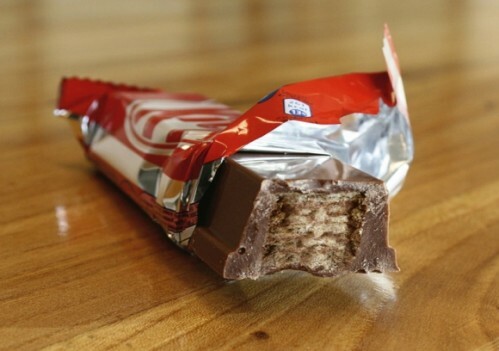 Can you tell race from Kit Kat art? @ColombianMonkey: Then please enlighten this ignorant little white girl, as to how you know that so certainly? Bearing in mind the difference between an African slave in Persia, and a natural Persian. And remembering that “Jews” existed in 12 different flavors, widely spread across the region, the majority of whom were no darker than the rest of the Middle East. @sylvanish: I’m ignorant on this to but he told me yesterday, since he wanted to get some facts straight. did someone say baskin robins? im down for some ice cream. who’s pan btw? lolwut?